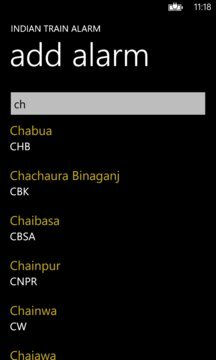 Be informed when your train is about to reach a station, using the location services on your Windows Phone mobile! No internet connection is required for the alarms to work. The alarms may be set with a triggering radius of 5km or 25km, and will be triggered within an error margin of 1/2 - 1km depending on the accuracy of the location fix. You can also set a live tile to show the current distance to the first alarm station.